Dr. Bjodne Eskeland (also spelled as Bjøedne) was the founder and creator of the Fertilized Avian Egg Extract, known previously as YTE or Young Tissue Extract. He was born on January 15, 1939, Norway. He was the author of “Norway’s Anti-Aging Miracle”. Professor Eskeland received a Master’s Degree in Science at the Agricultural University of Norway in 1964. He came to the United States for his graduate studies and completed his Ph.D. in Animal Nutrition at the University of Missouri-Columbia in 1971. He has been on staff at Norwegian Food Institute and the Environmental Toxicology Department at the University of Trondheim in Norway. In addition, from 1983-1985, he served as a visiting professor at the University of California, Berkeley, in the Department of Nutrition. Dr. Eskeland has spent a great deal of his professional life working in the egg industry in Norway. In the 1990s, he hypothesized that there existed in incubated and fertilized eggs a special protein fraction that could help increase and enhance the human body’s natural testosterone production, naturally, without testosterone supplementation. He then teamed with Nils Christian Mortensen, an Engineer by profession and founder of Med-Eq. Together, they developed the procedure to extract this special protein from fertilized eggs. Rediscovering the benefits from fertilized eggs was Eskeland’s life work. “I have spent a great deal of my professional life working in the egg industry in Norway. In the 1990s, I hypothesized that incubated and fertilized eggs contained a special protein fraction that could help increase and enhance the human body’s natural testosterone production, without supplementation. Dr. Eskeland spent a great deal of his professional life working in the egg industry during the 1990s with the help of Nils Mortensen who has access to medical equipment. In 2006, he published a short summary of his research on Young Tissue Extract and branded it as YTE®. He partnered with Amerikal Nutraceuticals Corporation (ANC), a company based in the USA. Although John Ralston Davidson should technically own the rights for the egg extract, he chose not to patent the formula. Decades later, it was registered and patented as YTE®, apparently with or independently between Eskeland and Mortensen. In an interview in 2014, Mortensen said that he bought the patent in 1994 from the Norwegian government (Food Research), when at that time he owned 50% of Medeq. The company was based in Norway which supplied the base ingredient YTE for LPGN for a short time until LPGN was able to produce its own version through Eskeland in the United States. Eskeland died on June 28, 2015. Medeq who supplied the base ingredient YTE for Laminine was having difficulties supplying one of the raw materials. It was then that LifePharm (LPGN) invited Dr. Bjodne Eskeland to be on board LPGN. After all, he was the author and founder of YTE and his knowledge in this specific ingredient contributed immensely in LPGN coming out with its own formula called Fertilized Avian Egg Extract or FAEE. With a new way to extract YTE, Dr. Eskeland together with the LPGN Research Team was able to create the best egg extract formula. Instead of YTE, it was referred to as an incubated Fertilized Avian Egg Extract (FAEE). 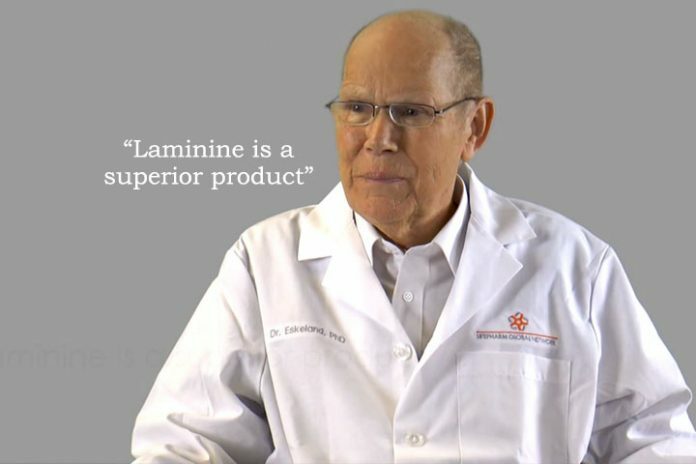 The proper blend of FAEE with other ingredients has positioned Laminine to be a superior product compared to other YTE products. The relationship between Dr. Eskeland and LPGN began many years earlier. He was an important consultant and scientist in LifePharm Global Network. His research on YTE was the foundation for developing Laminine’s OPT9. He was set to visit the Philippines in September 2015 unfortunately, Dr. Eskeland died the same year. Dr. Bjodne Eskeland died on June 28, 2015. He will always be remembered as the founder of YTE, a man whose contribution in egg research has saved lives. A great researcher, scientist, and friend of LifePharm Global Network.